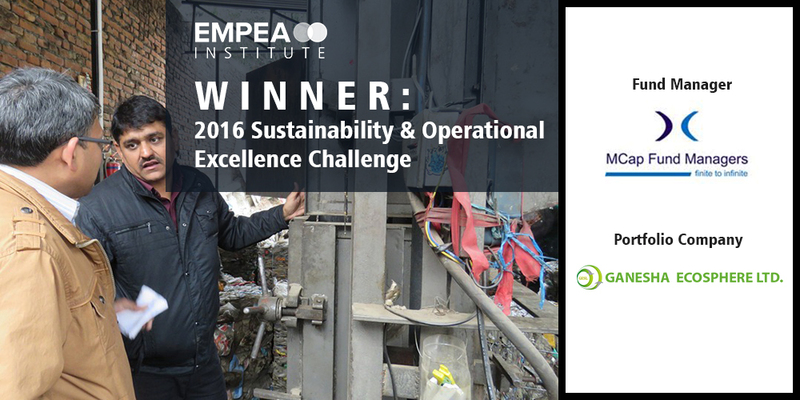 Case Study: Ganesha Ecosphere Ltd.
MCap Fund Managers, an India-focused multi-strategy PE investment advisory firm, was awarded the winner of the EMPEA Institute‘s 2016 Sustainability & Operational Excellence Challenge for its active management of Ganesha Ecosphere Ltd. (GESL), a PET bottle waste recycling company in India that creates polyester fiber and yarn. Recycled fiber has traditionally been sold as a cheaper alternative to virgin grade products; however, MCap believed that it should actually be sold at a premium given its value to the environment. By marketing the strengths of recycled fiber and positioning it as an environmentally friendly product to several global retailers focused on industries such as apparel, sports, adventures and bags, the private equity firm was able to broker several initial orders with improved realizations. One of MCap’s highest priorities was the implementation of high-end environment, health and safety (EHS) measures across all of GESL’s business entities. MCap decided to increase its investment in the company by an additional US$500,000, with the new capital specifically targeting EHS improvements. As of October 2016, two of the company’s units had become fully EHS compliant, with the last unit expected to become so by the end of the year. With MCap’s assistance, GESL is increasing its recycling capacity by an additional 21,000 tpa by September 2017, resulting in the saving of landfill space, lower energy use and a reduction in CO2 emissions. Portfolio Company: Ganesha Ecosphere Ltd.